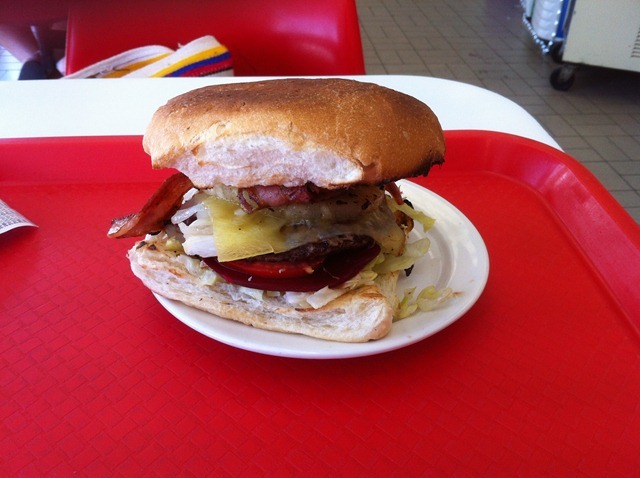 Readers of Thomo’s Hole will know that Thomo is partial to the odd burger. In the past the burger of choice when travelling to mama’s was always the works burger at the Caltex servo at Coolongolook. That servo appears to have changed hands recently and the quantity and quality of food in the restaurant has diminished. This trip we decided to try the Mobil servo at Bulahdelah after a recommendation from a bloke I met on a flight from Singapore to Sydney. The burger was quite good and I’d certainly rate it a 7 or maybe 8 out of 10. The only downside was the tables and chairs. The chairs are fixed to the table which is fixed to the floor. Not so good for a gentleman of more fulsome figure – the empty part of belly being on top of the table and the remaining paunch tucked away Nader under the table. 1 out of 10 for the tables.